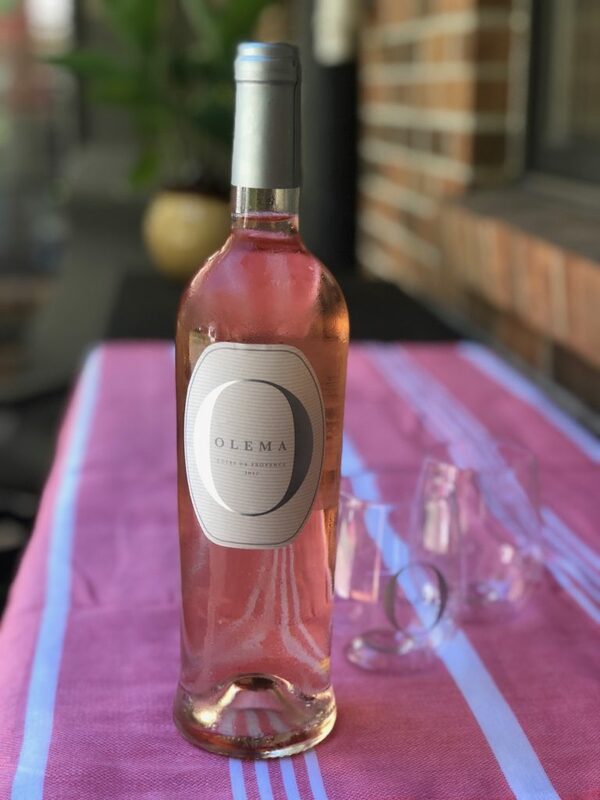 This post is sponsored by Olema Wines. 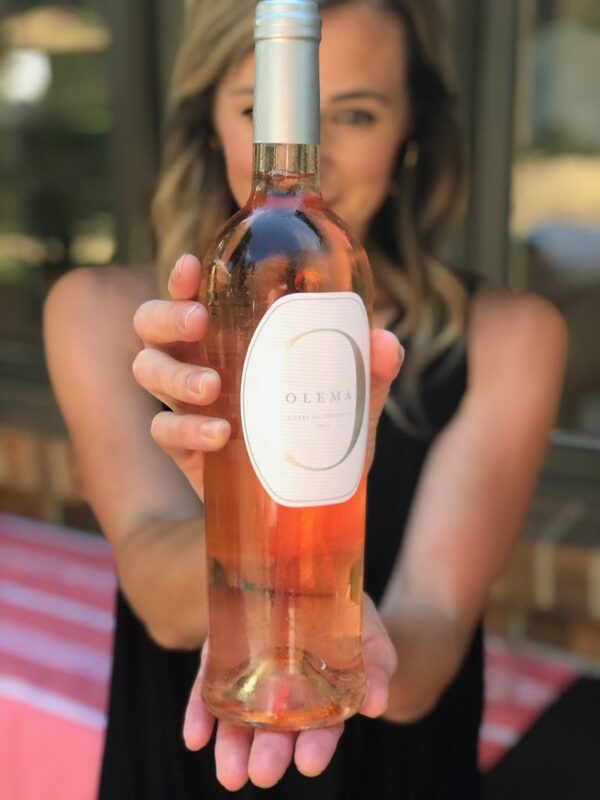 Well, they didn’t pay me to write the post, but they did send me some yummy wine in hopes that I would love it enough to talk about it and guess what? It was awesome, so I’m sharing it with you today! Thanks for supporting the brands that support Espresso and Cream! Summer has gone so quickly this year! Anyone else? I think it’s due in large part to the fact that we have been working on our patio project ALL summer long and this weekend we finally got it finished! I guess saying “finished” is a little misleading because now our yard looks like a hot mess filled with dirt and piles of rock and we haven’t even started the landscaping around the patio, but the actual patio is finished and I am SO proud of Joe for all the hard work he put into making this possible. He worked alongside a friend who had some landscaping experience and helped with the technical parts of the patio, but the amount of dirt-moving and manual labor that Joe put into this patio is crazy. It also helped us save a LOT of money doing so much work ourselves. 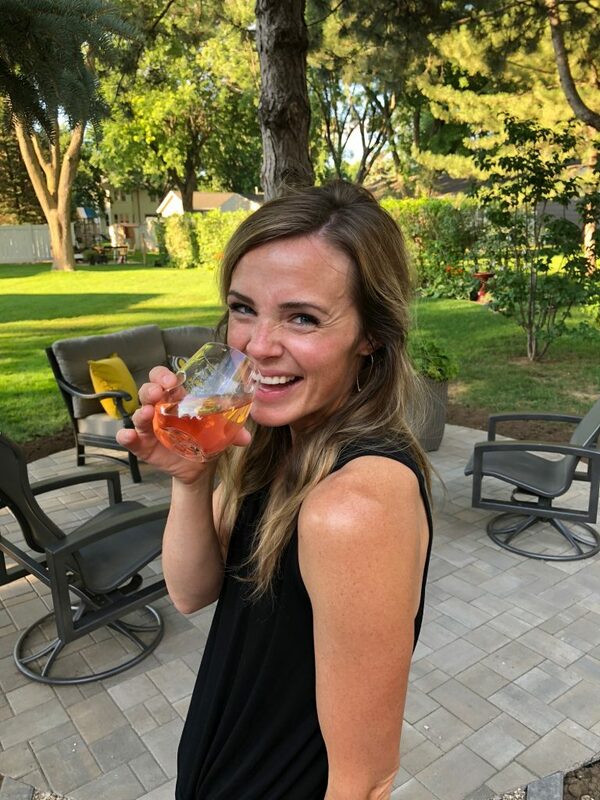 A full patio project recap is now in the works, but in the meantime., I’m going to talk about pizza and wine, mmmkay? 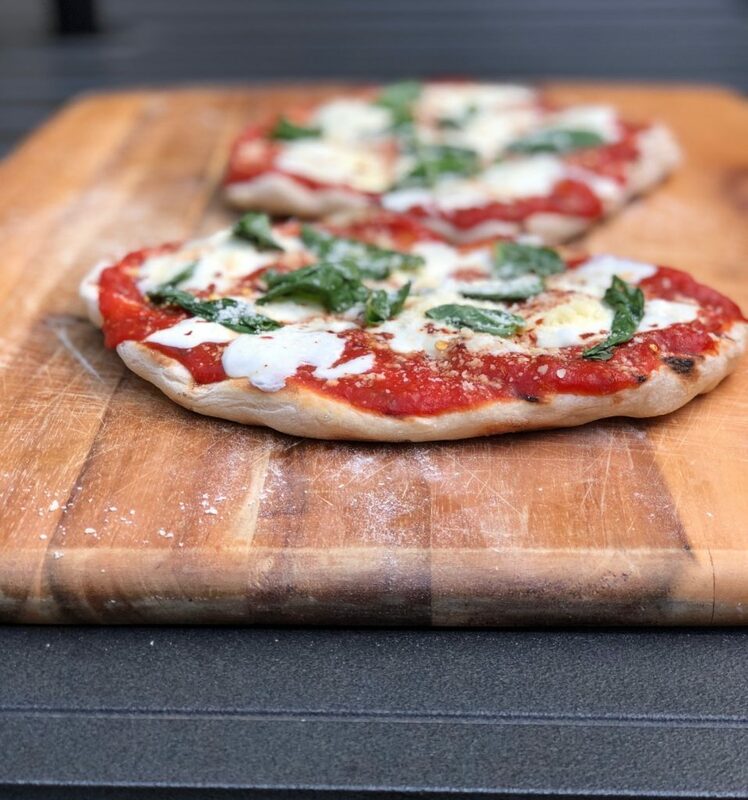 We christened our new patio by having a few friends over for grilled pizza + wine and every time I make grilled pizzas for a group I’m reminded why we need to do so more often. 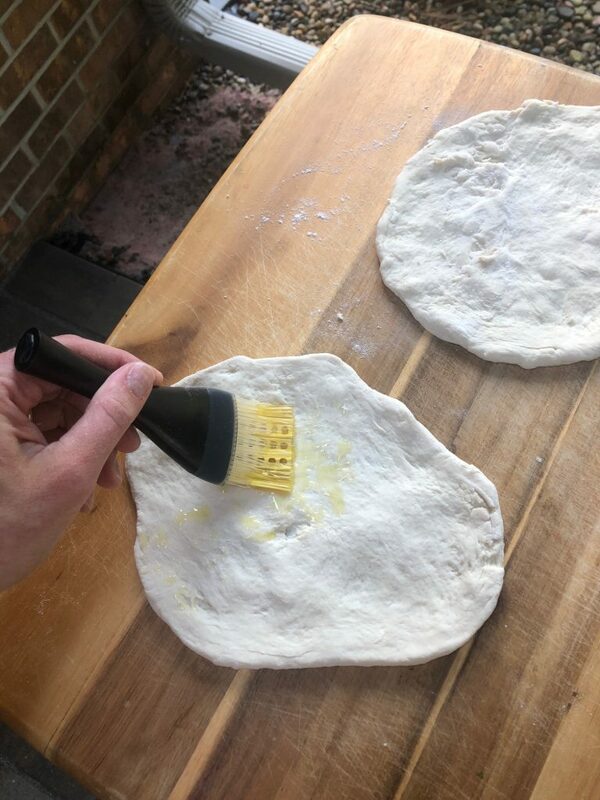 We’ve been grilling pizzas for years, and while it’s a little more hands-on than, say, grilling meat, it’s definitely fun to do something different outside of the typical burgers + brats + chicken, etc on the grill. By the end of the summer, we are ready for something fresh. Sitting under our patio table umbrella, drinking some really great rosé wine from Olema Wines, and eating grilled pizza, salad, fresh green beans and mixed berries felt almost like we were transported somewhere much fancier than our house, minus the giant dirt piles and general disarray of our yard. Ha! 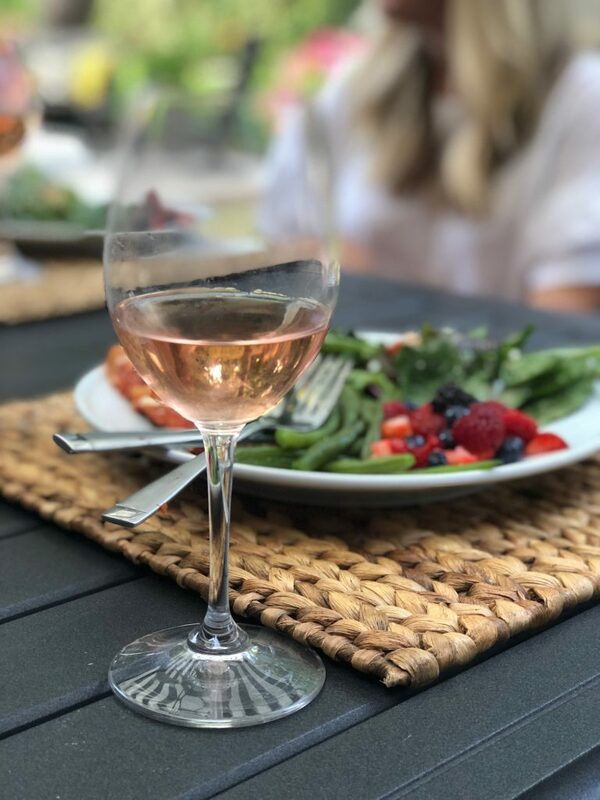 I will say that I have *no* idea if rosé wine is a good pairing with grilled pizza from an expert’s perspective, but I thought the entire meal was delicious! 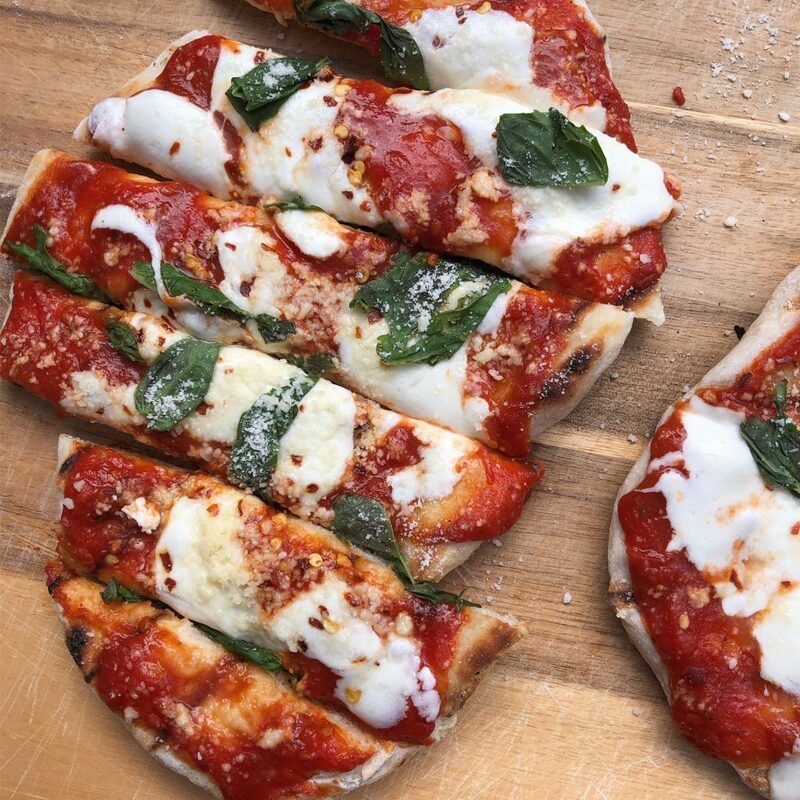 So let’s talk a bit about grilling pizza, shall we? Make sure your grill is HOT. Like 450°F – 500°F hot and that your grill grates are clean. Sometimes I’ll get the grill really hot first and then give the grates one more cleaning with a grill brush to make sure they are super clean. 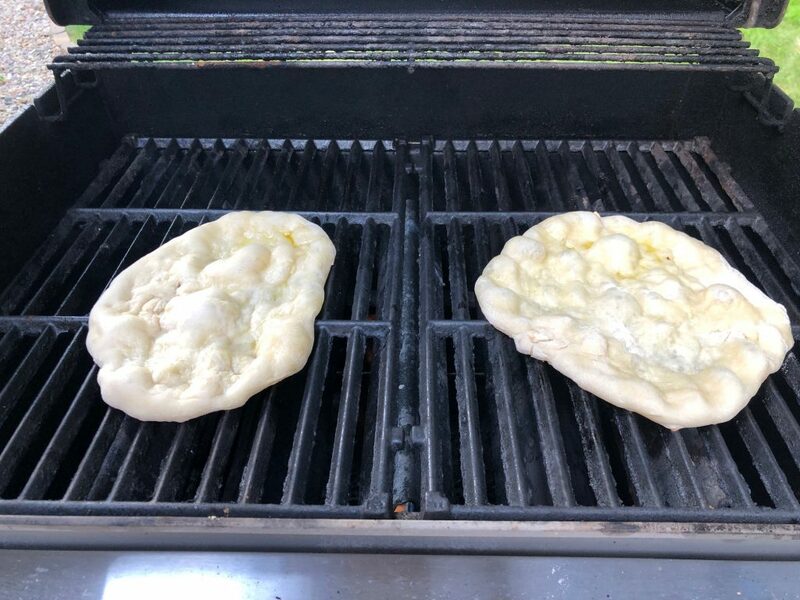 Dirty grill grates will stick to the pizza dough and leave you with a mess. Put together a “toppings tray” ahead of time. 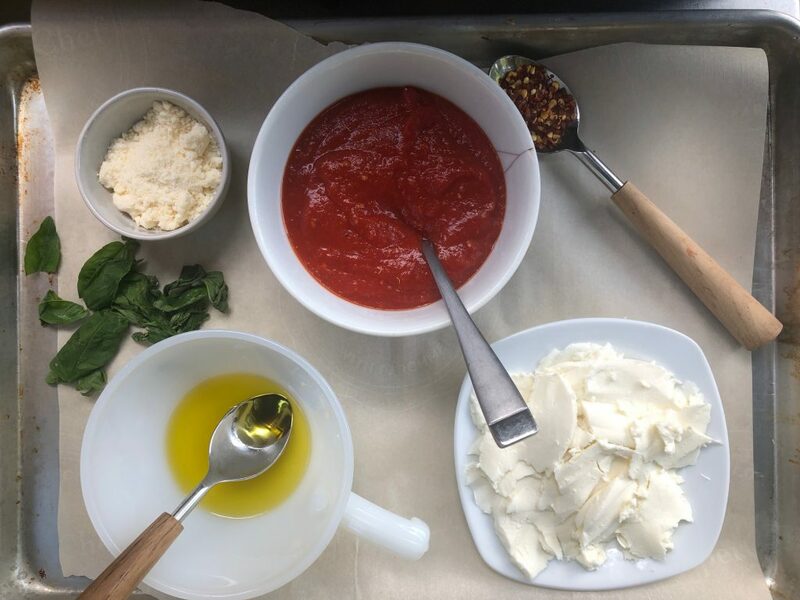 We’re talking everything you need to top your pizzas, including olive oil + pastry brush, pizza sauce, cheese + fresh basil and whatever else you want to use for pizza toppings. Grilling pizza at a high temp on the grill goes FAST so you need to be ready to top the pizzas quickly. Don’t top the pizzas too heavily. The thin dough doesn’t need a lot of sauce and toppings. In fact, it’s better if you use a light hand when topping with sauce, cheese and toppings as to not overwhelm the dough. 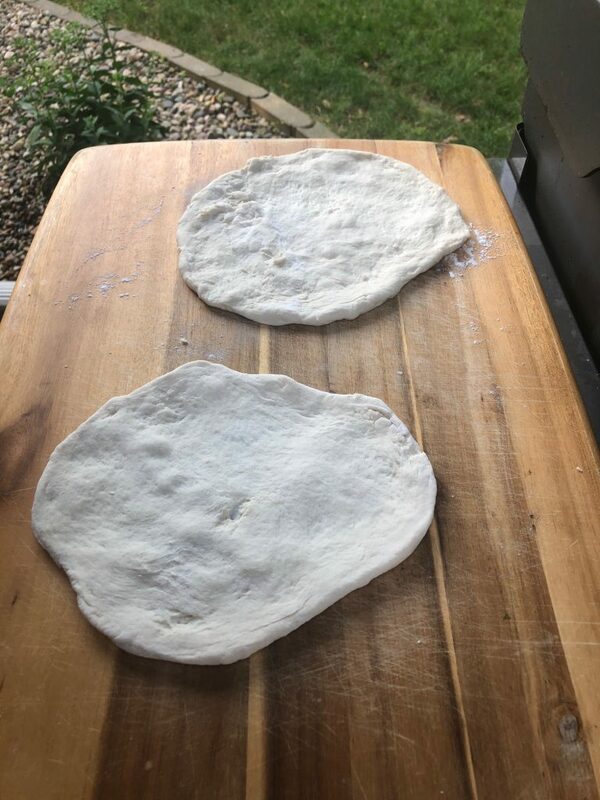 Be sure to stretch the dough thin enough. You want to stretch it out as thin as you comfortably can without ripping holes in the dough. The grill is HOT meaning you can’t leave the dough on too long before it burns. A little char is good, too much isn’t, so you want the dough thin enough that it cooks through before you need to remove the pizza from the grill. Add the salt and 2½ cups of the all-purpose flour to the water mixture and use a rubber spatula to combine. Transfer mixture to a lightly-floured surface and gradually kneed in the remaining ½ cup flour over the course of a couple minutes, adding a little at a time. The dough should be smooth and elastic, and just the tiniest bit sticky but not so sticky that it easily sticks to your hands. Add additional flour if necessary, a tiny bit at a time. Transfer dough to a lightly greased mixing bowl and cover with a towel. Allow to sit in a draft-free location to rise for 2 to 3 hours, until dough is doubled in size. Punch down dough and cut into four pieces. Form each piece into a round. Stretch each round into a thin disc (see note above in the tips) using extra flour if you need to prevent sticking. Heat grill to the hottest it will go - around 450°F to 500°F. Once grill grates are good and hot, brush dough lightly with olive oil. Place the oiled side on grill grates. Cover and cook 2 to 3 minutes until dough is charred and bubbly. Brush uncooked side of dough with olive oil and flip. Quickly top with sauce, cheese and desired toppings. Cover and cook 2 to 4 minutes more until cheese is melted and dough is cooked through. Transfer to a cutting board and top with fresh basil, grated Parmesan cheese and crushed red pepper, if desired. Cut into strips to serve. I’ve been thinking a lot (and I mean a LOT) about what I want Espresso and Cream to look like in the next couple of years. As I mentioned a while back, I was feeling seriously lack for inspiration and guidance on what I wanted this space to be. 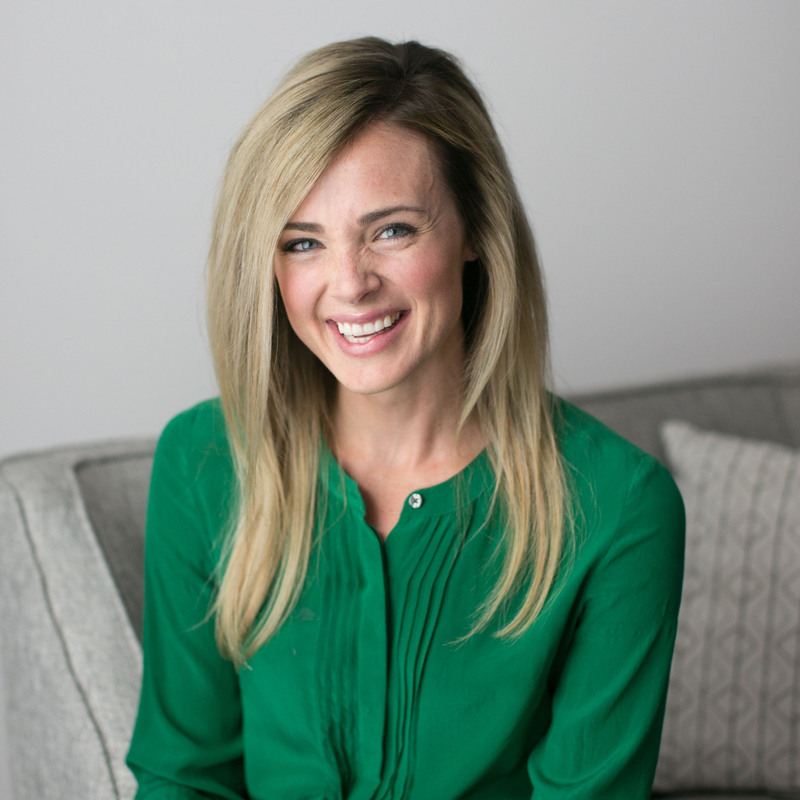 When you’ve had a blog for over seven years it morphs and changes over time and I was left feeling that my site had become less cohesive than ever before. A completely random mix of whatever I felt like posting. Or perhaps more accurately, whatever I felt like not posting. After taking some time to really take inventory of my heart and passions for this little corner of the internet, I’ve realized that more than anything I miss posting recipes. As I’ve been developing more recipes in my freelance career, I’ve wished that I wasn’t always giving the best photos and the best ideas to others but keeping some of those ideas to share with you all on Espresso and Cream. So you’ll be seeing more recipes and more consistency with those recipes going forward. These categories will, hopefully, give me enough breathing room to be creative while also providing me with guidelines for what does and does not fit on the site. Hearing you all share about what you love about Espresso and Cream was so helpful and you have no idea how much I appreciate your thoughts and input in this process. So, without further delay, today I’m sharing one of my favorite easy family meals. My mother-in-law is a fabulous gardener and we benefit from all the spaghetti squash she grows every year. I especially appreciate that spaghetti squash store well in the pantry for quite a while, so I have time to work through our supply before they go bad. For me, pasta night is really not about the pasta. Pasta is mainly a vehicle for marinara sauce and cheese, so I’ve been happy to swap out the pasta for spaghetti squash, and I think you’ll find that your family is, too. 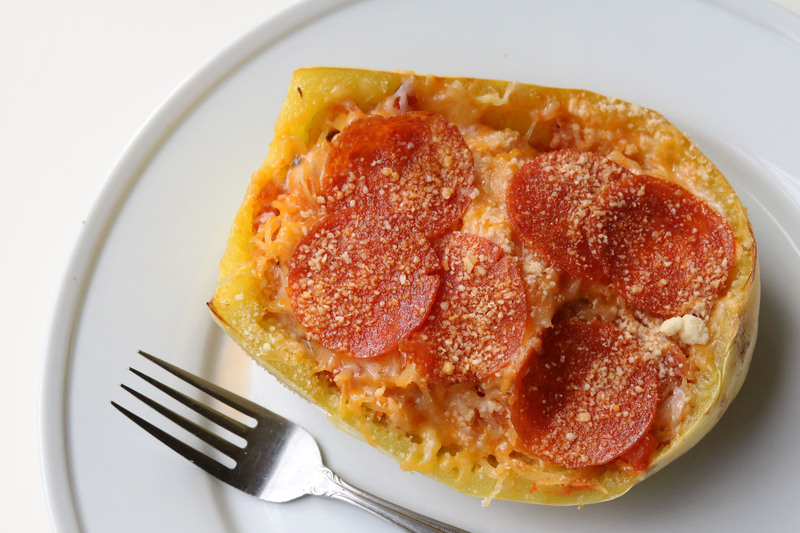 This play on pepperoni pizza is just kid friendly enough to please little eaters but good enough to satisfy the adults in your house, too. Scrape/shred spaghetti squash halves to make noodles. 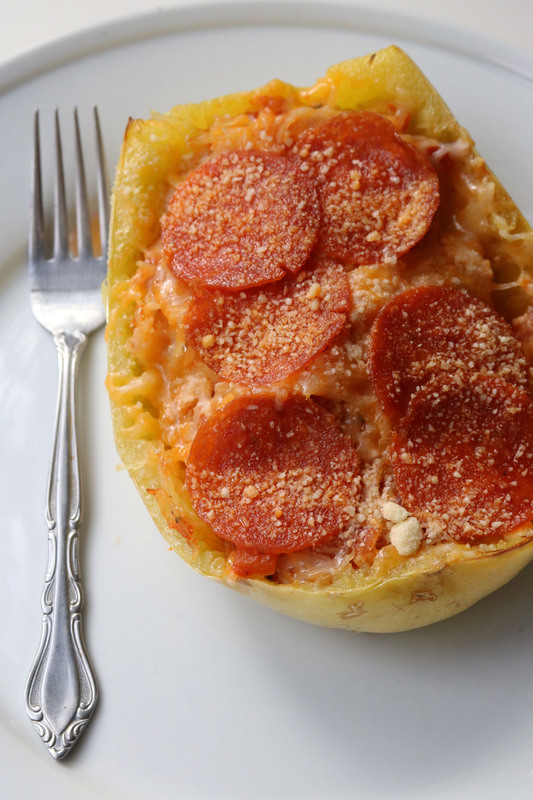 Pour ½ cup of marinara on each half and toss sauce with spaghetti squash in shells along with ¼ cup each of cheese. Top each with 5 pepperoni and sprinkle with grated Parmesan cheese. Return to the oven and bake 10 to 15 minutes more or until cheese is melted and bubbly. Easy weeknight meals. Gosh, isn’t everyone in search of more of those? Honestly, despite the fact that the kitchen is my happy place, I still get flustered and frustrated about weeknight dinnertime. We all know how rushed it can feel to get a meal on the table in the short two hours between 5 and 7. You know, after work and before the kiddos totally melt down and refuse to eat because they are tired? The rush to eat dinner, get bath time done, read books and drink bottles and get everyone to bed and I hate when that time feels like a giant race against time. Hence, I’m always looking for easy meals that can be made in advance so the night is less stressful and everyone is well-fed and happy. 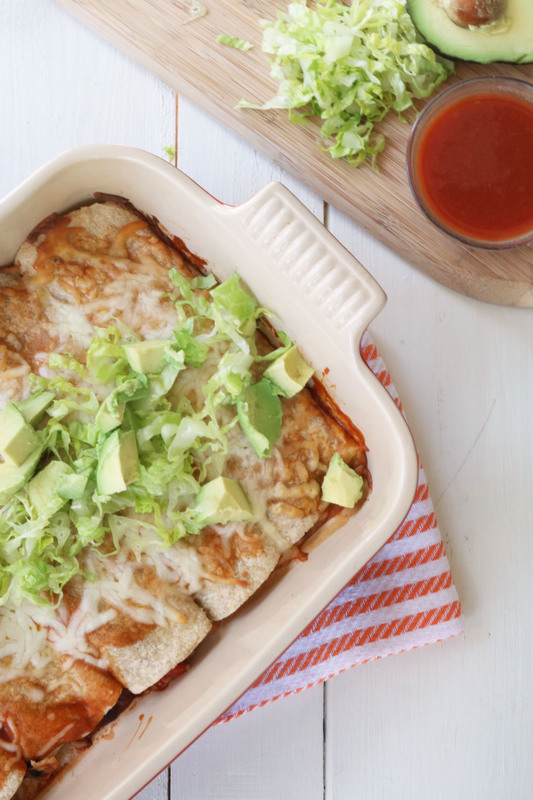 Enchiladas have always been a go-to recipe for our family because they’re easy and can be customized in so many different ways. 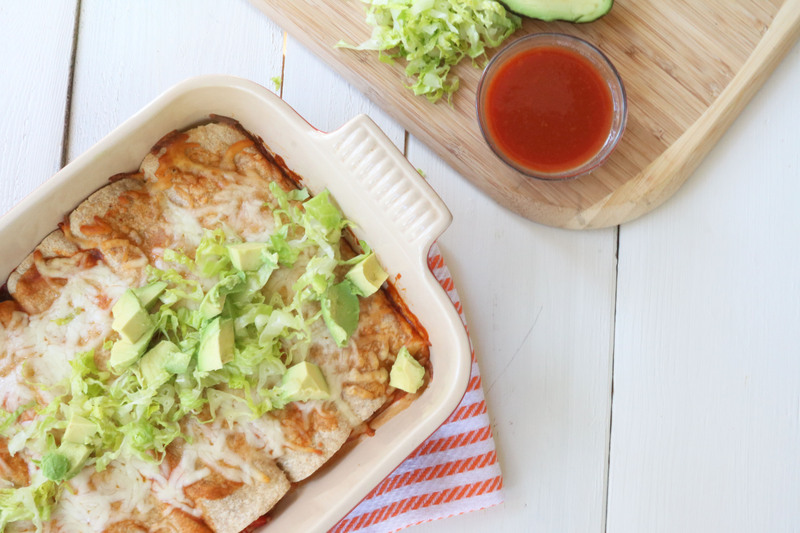 I made a version of these enchiladas a few weeks ago when friends were in town. They were so easy to pull together and provided me with a vegetarian option to enjoy. I also made a pan of Green Chicken Chile enchiladas that night, but these were just as popular! The recipe includes an option to make them non-veg, or partially veg (half pan for the vegetarians in your life/half for the meat eaters!) so there are a lot of ways this recipe can go. Don’t feel stuck by the ingredients I used. Customize them using this recipe as a base. To make this in advance, prepare/assemble the enchiladas but stop before baking them. Cover and store in the refrigerator for 24 hours, then bake as directed! 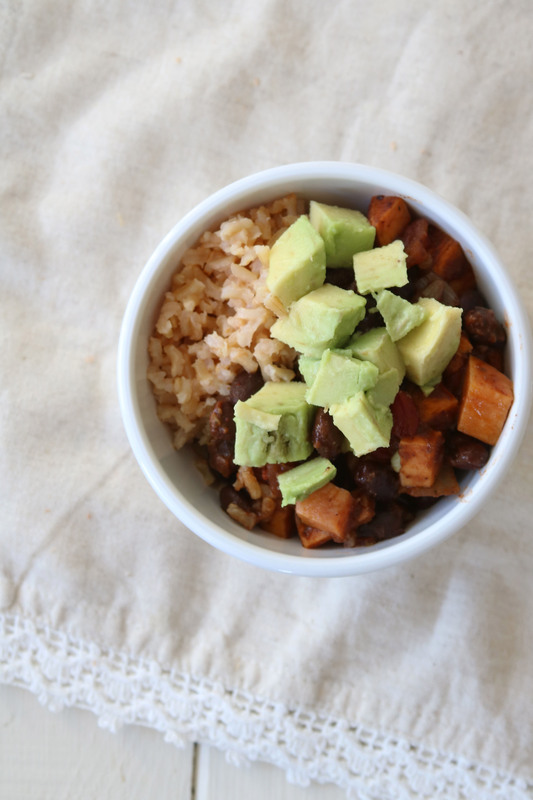 *Non-Veg Alternative // Swap the can of black beans for 1 lb. of browned and drained ground beef. Alternately, you could make this veg and non-veg like we do, and do black beans in half the enchiladas and ground beef in the other half, using ½ the amount of both ground beef and black beans. Heat oven to 350°F. Grease a 13x9-inch baking dish with non-stick cooking spray. Spread ¼ cup of the enchilada sauce in the bottom of the baking dish. Set aside. In a large mixing bowl, combine the tomatoes, black beans, farro (or other grain of choice), ¾ cup of the cheese, cumin, oregano and garlic powder. Stir until well combined. Add all but ¼ cup of the remaining enchilada sauce and stir. Divide the mixture between the six tortillas. Roll up tortillas and place them in the prepared baking dish. Spread remaining ¼ cup of enchilada sauce on top of tortillas. Sprinkle with the remaining ¾ cup cheese. Cover pan with foil and bake 30 minutes. Remove foil and bake 15 more minutes or until cheese is bubbly and melted. Serve with lettuce, avocados, salsa and other desired toppings. Since we ran in 2016, I’ve been making a real, honest effort to get back into the kitchen for non-work related purposes. For me that means more meal planning, taking the time to prepare a grocery list based around sales fliers and coupons, and then actually sticking to that meal plan. What I’ve realized is that we not only eat healthier (duh!) but our meals are more interesting and fun and we spend so much less on groceries each week. 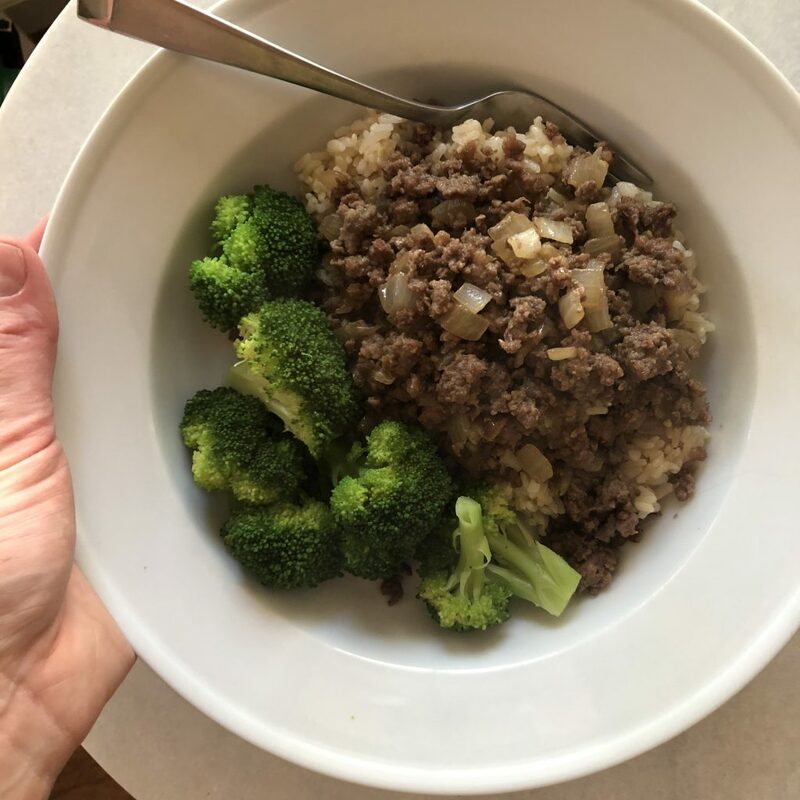 I’m making it a goal of mine to share more real, everyday meals with you. Because sure, I can make a really beautiful, involved recipe to share on this blog, but chances are you don’t have the ingredients on hand nor the time or interest in actually making said recipe. So instead of sharing a Pinterest-perfect meal, I’m going to be sharing more real meals from the Hofmeyer kitchen. You know, the stuff we’re eating week in and week out! I’ve been working with the team at Riceland Foods on some recipe development, so we have a surplus of brown rice on hand. Joe has been joking that we are going to be eating rice for the next month, which is probably very, very true. I’m a big believer that rice and beans is one of the best meals around. Basic, healthy, cheap. But if we’re going to consume rice and beans in this house, Joe needs it to be a little more interesting than the basic version. Our whole family enjoyed this dinner. It was healthy, relatively quick and easy to make and completely filling. 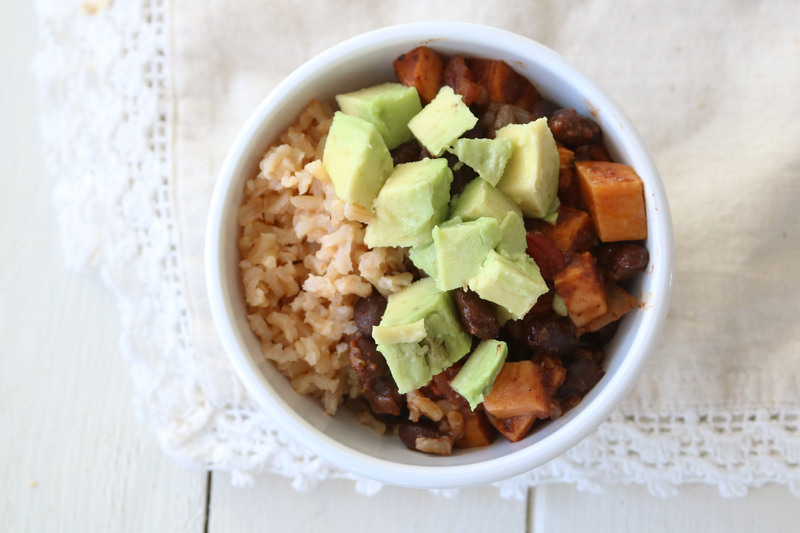 I added sweet potatoes to the mix for a little color and added nutrition and topped the bowls with chopped avocado and salsa. And I totally would have added sour cream if we had it on hand! In a medium skillet over medium high heat, heat the olive oil. Add in the onion and cook 3 to 5 minutes, stirring frequently, until onion is cooked and softened slightly. Add in the garlic and sweet potatoes and cook 2 minutes more or until garlic is fragrant. Add the black beans, tomatoes, oregano, chili powder, cumin, garlic powder and cayenne to the skillet and reduce heat to medium. Simmer 15 minutes, stirring occasionally, until mixture is thick and sweet potatoes are softened. Spoon brown rice into bowls. Top with some of the black bean mixture, followed by some avocado and salsa, if desired.